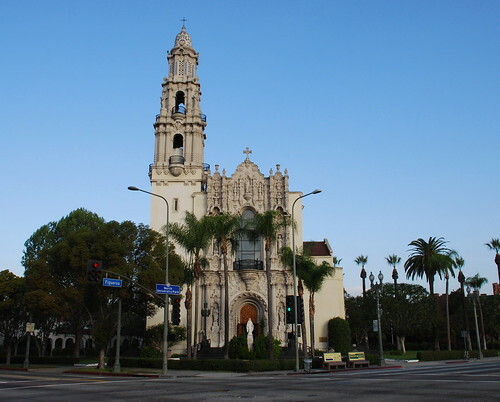 St Vincent de Paul Church at the corner of Figueroa and West Adams received formal dedication on April 12, Easter Sunday, in 1925. Father Martin G. Hanley preached the sermon. That’s according to a contemporary L.A. Times account. 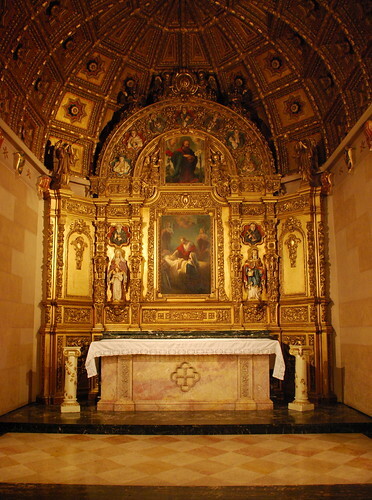 Don Sloper, in Los Angeles’s Chester Place, says the first mass was held the Sunday before, with the Rt Rev. John J. Cantwell, bishop of the Diocese of Monterey and Los Angeles, presiding. So let’s say the church opened during the first half of April, 1925. It was back in September, 1922, though, when Father J.H. 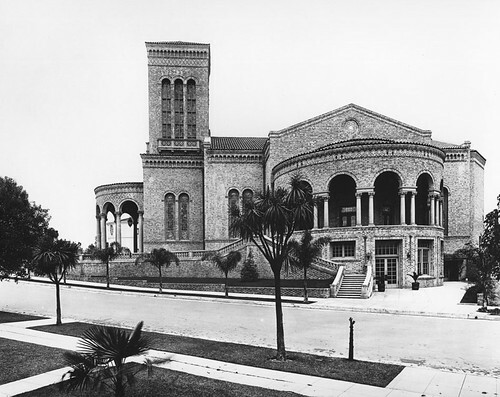 MacRoberts, St Vincent’s pastor, announced gazillionaire Edward Doheny had pledged a quarter of a million dollars to the building of which at that time was planned to be a $500,000 church (it was later pegged at one million). “A large part of the other portion has been pledged as well.” The church had already owned the land for a couple of years. 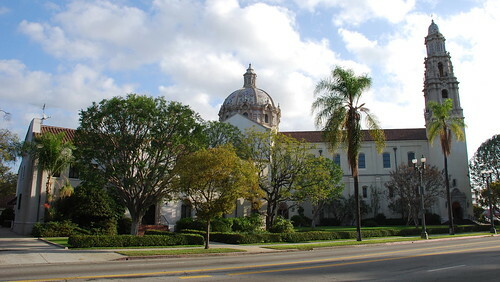 The Automobile Club of Southern California was at that time under construction across the street and the gated community of Chester Place and Doheny’s own mansion sat (and still sits) a couple yards to the west. Bishop Cantwell and Rev. MacRoberts approved design sketches by Albert C. Martin in December, 1922. 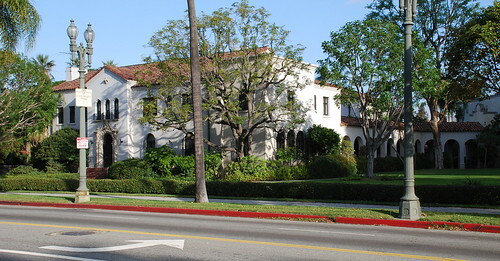 Martin had designed L.A.’s first major Churrigueresque-style building, the Million Dollar Theater on South Broadway, in 1918. 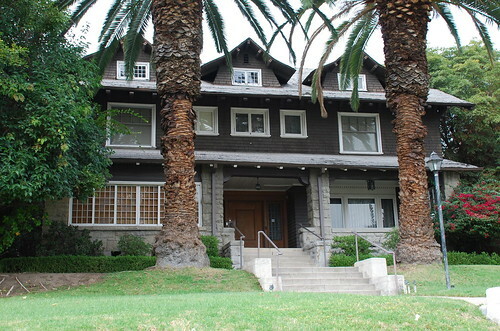 Martin was also part of the teams that designed Los Angeles landmarks City Hall (No. 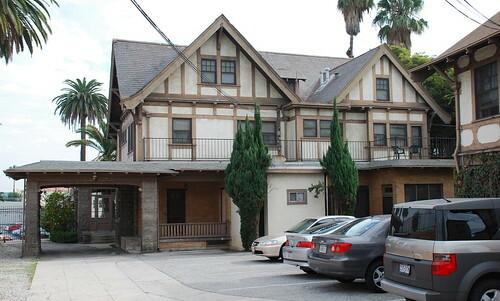 150) and the May Company on Wilshire (No. 566). 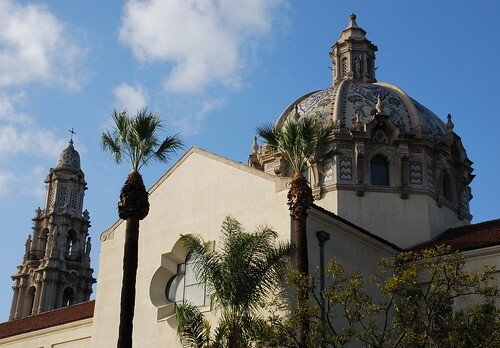 For St Vincent’s, the architect was inspired by Bertram G. Goodhue’s California Building from the 1915 San Diego Exposition (it’s still there today, but now known as the Museum of Man in Balboa Park) as well as the Santa Prisca, a historic church in Tasco, Mexico. Crews broke ground in 1923, while the majority of construction occurred throughout 1924. 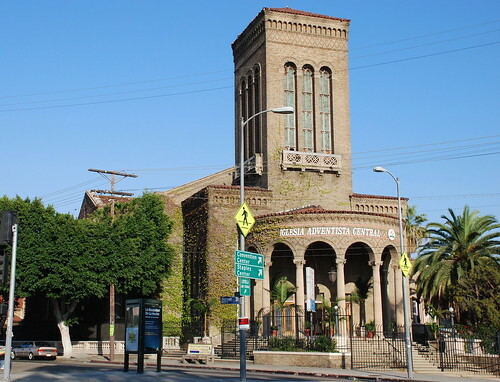 And, man, what a busy year for L.A. churches it was, too. 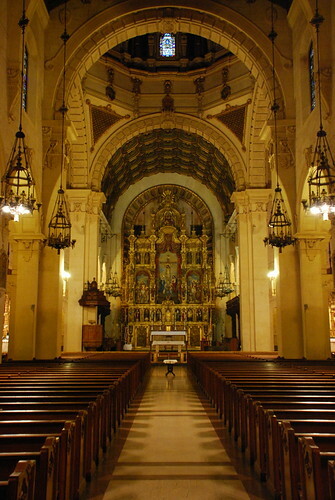 According to a Los Angeles Times article from New Year’s Day, 1925, the city saw construction of 62 new churches that year. 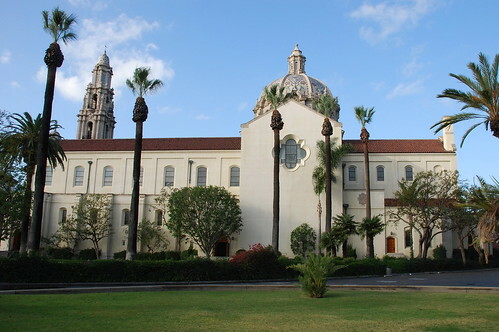 The new houses of the holy, at a cost of nearly $7.3 million, brought L.A.’s church tally to 412. 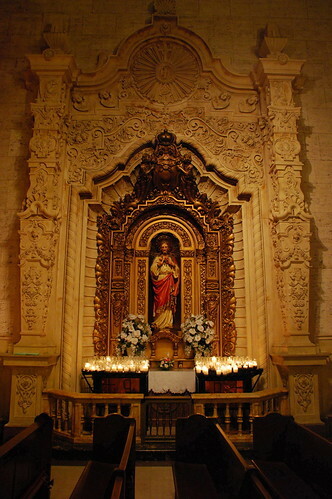 The Churrigueresque church is in the shape of a cross and sits at a 45-degree angle to the intersection, better providing diners at the Popeyes across Figueroa unobstructed views of the eighty-plus-year-old church. 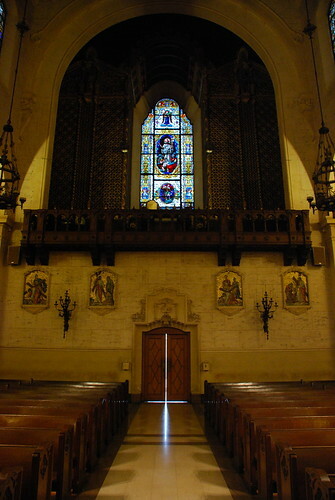 While Ralph Adams Cram designed the interior, the interior ceiling decoration is by John B. Smeraldi. 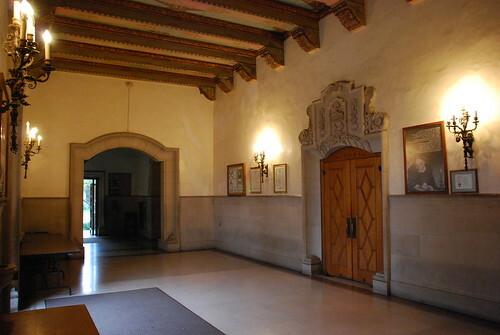 Just around that time, Smeraldi was also working on the ceilings at the Biltmore Hotel downtown. Busy guy. 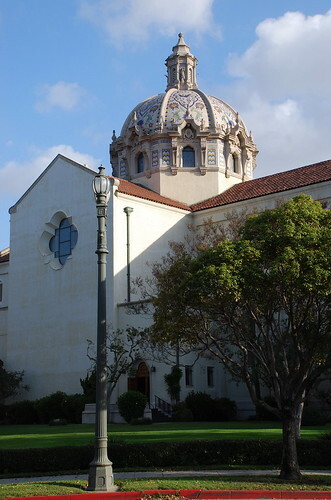 The Wurster Construction Company’s E.M. Lukens reported the strength of that 44-foot concrete dome was tested by hanging sand bags from “the entire circumference of the dome to the weight of thirty pounds per square foot and an additional thirty pounds per square foot over one-half the circumference.” After two days, an additional ten tons was suspended from the center with no deflection noted. 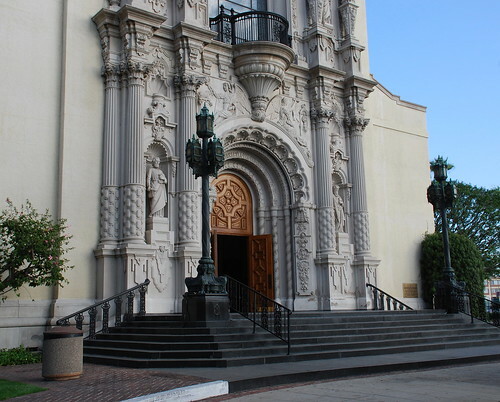 St Vincent de Paul Church has a seating capacity of 1,200. Finally, since you’ve made it this far and have been so patient, St Vincent de Paul was a 17th-century French priest. Pope Clement XII beatified him in 1737, the patron of charitable societies. 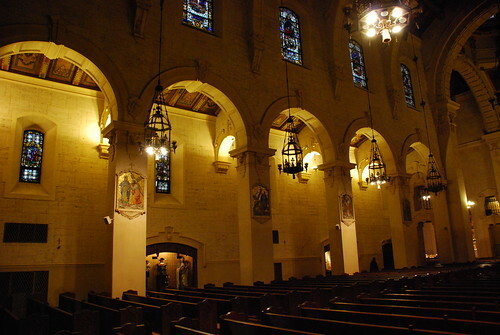 This Romanesque/Beaux Arts church was originally built as the home for the First Church of Christ, Scientist. 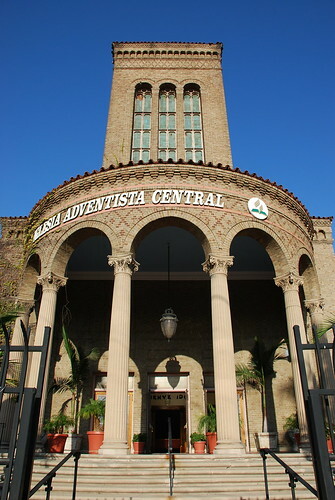 For about the past thirty years, it’s been the Central Spanish Seventh-Day Adventist Church. 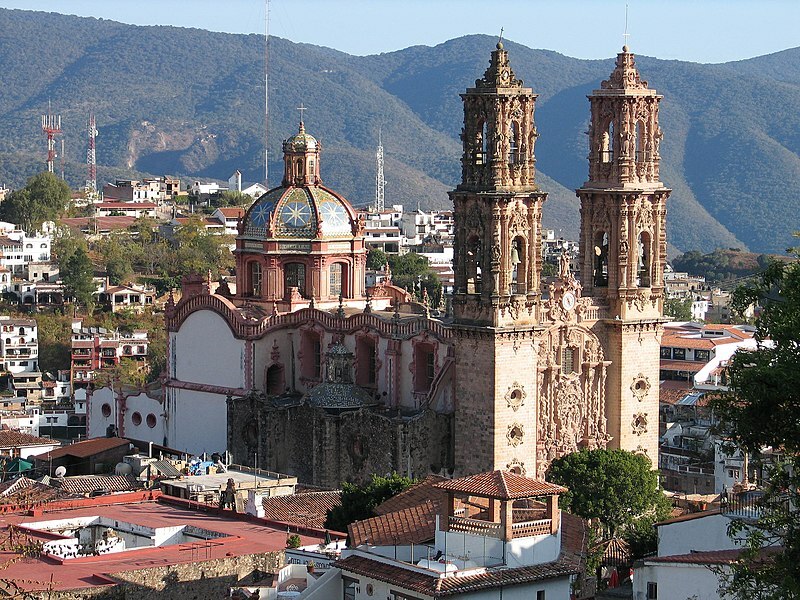 Today, Ever Garcias is the senior pastor for the Central Spanish congregation, while the Reverend Moises A. Sandoval presides over the Sunday meetings of the Centro Cristiano Emanuel. 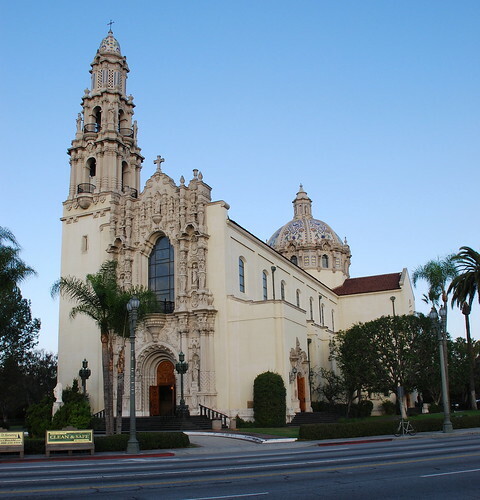 When architect Elmer Grey first submitted preliminary studies for the church in February of 1912, costs were planned at around $100,000. Construction began on June 10 later that year. 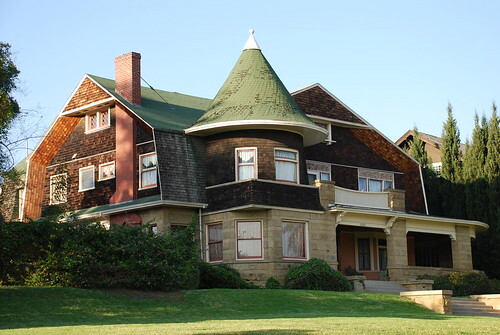 The building was designated on the same day as the previous six homes on the Historic-Cultural Monument list for their “reflecting Victorian architecture on a grand scale prevalent at the turn of the century”. The most notorious part of the church’s history, though, is its life in the 1970s. 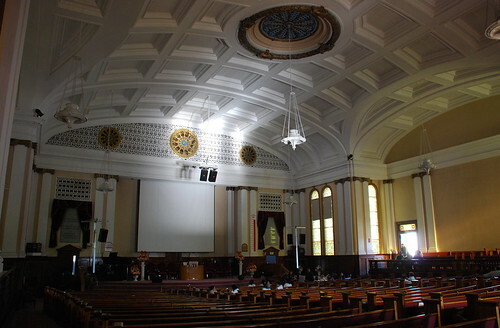 At the beginning of the decade the building was converted from a synagogue to house the Disciples of Christ congregation of the People’s Temple Christian Church, run by the Reverend Jim Jones. Yes, that Jim Jones. Jim “It’s hard to be God” Jones set up (another) shop here, after establishing temples in San Francisco and Utah. Throughout the seventies, his popularity grew while his congregation soared to 20,000. 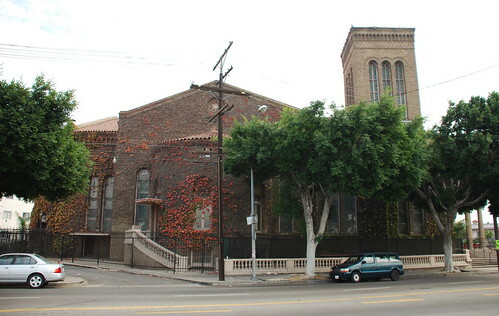 Jones would come to Los Angeles every two weeks to preach to the nearly all black congregation here. 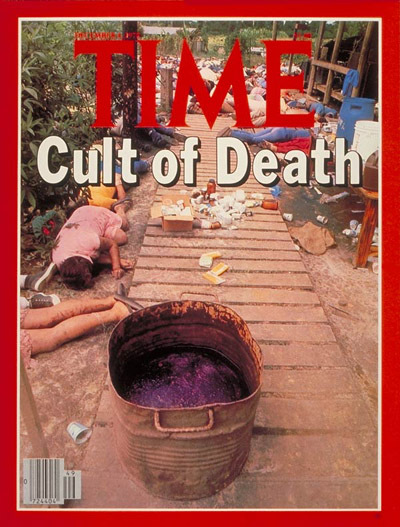 In the summer of 1977, he moved a group of his followers to Jonestown in northern Guyana where, the following November, more than 900 of them died in the mass murder/suicide that was in all the papers back then. Today, the church is surrounded by fencing to keep out vandals, the homeless, etc., but otherwise looks a lot like it did 80-odd years ago, as in this shot from 1915 above. Special thanks to Francisco, a congregation member who, one Saturday afternoon, showed me around and filled me in on some of the building’s recent history. 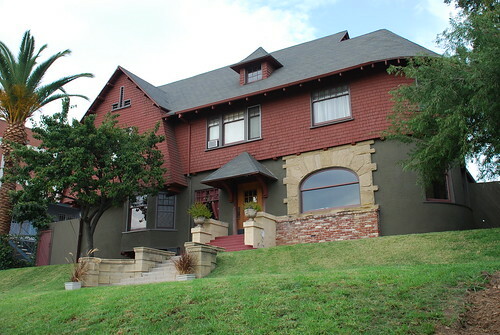 The last of the half a dozen houses designated Los Angeles landmarks on July 7, 1971 (along with a church down the street, No. 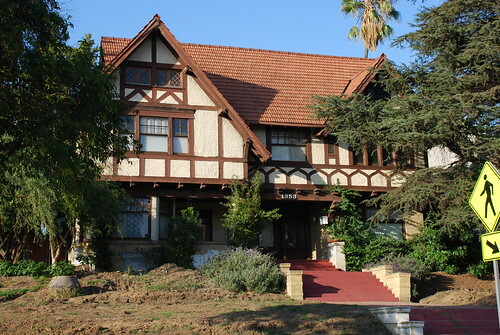 89), this home was built for Arthur W. Kinney. 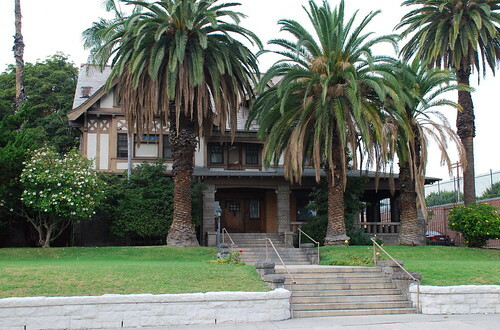 McGrew and Julian’s Landmarks of Los Angeles says Kinney owned an iron works and was a director of the Oceanic Oil Company. The lot cost $3,550. I ran into the owner outside the house when I was there taking pictures. He told me, despite being encouraged to carve up the property into even more units, he’s still got it divided into just four apartments, pretty much the way it’s been since the 1920s. 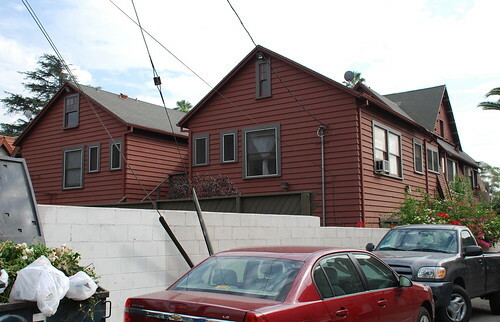 So, a quick re-cap of these past six homes, all in a row, on Alvarado Terrace. 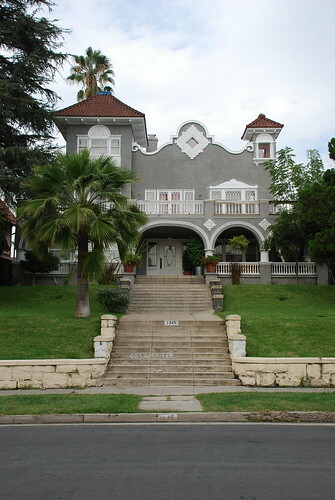 They’re listed collectively in the National Register of Historic Places as part of the Alvarado Terrace Historic District. 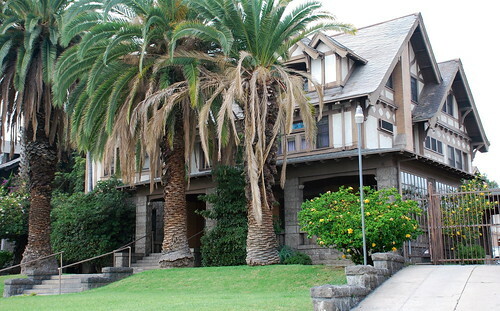 The group is included in the Pico-Union Historic Preservation Overlay Zone (HPOZ). 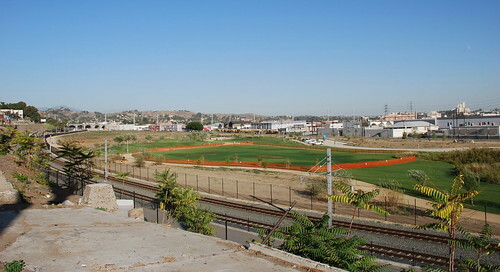 It’s also part of Los Angeles’s Community Redevelopment Agency’s (CRA/LA) Pico Union 2 Redevelopment Project. 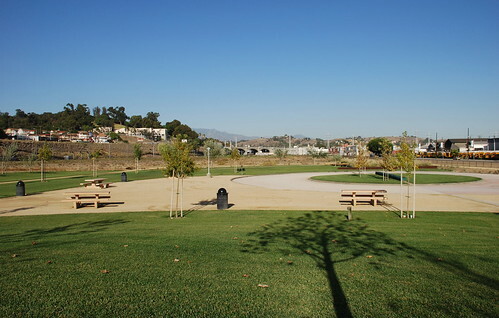 The homes sit on the site of Los Angeles’s first golf course, Windmill Links. No building is allowed to be erected on the tract that will cost more than $4000, and all must be set back forty feet from the street. With the building restrictions, which are to be rigidly enforced, and its fine location, this tract is undoubtedly destined to become a choice site for elegant homes. The street improvements are being made at the expense of the present owners, and are the best, and the plan of having curved streets, which conform to the contour of the gently-undulating hill on which the terraces are laid out, is one that many will find very attractive. 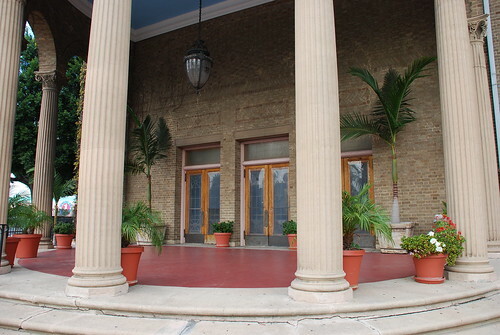 Alvarado Terrace street is a wide and beautiful avenue, and at its entrance on Pico street are placed three granite columns, each supporting a lamp. A vacant plot of ground at this entrance is to be planted in palms, grass and flowers, and other attractive features, that will tend to beautify the tract, and must necessarily add to the desirability of the lots as building sites, are being planned by the owners. One last shot, this of the Kinney-Everhardy House along with the Raphael House. 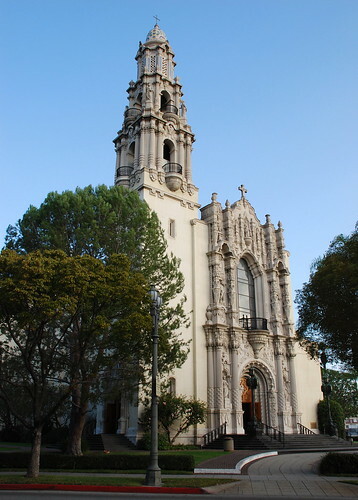 Los Angeles Cultural-Historic Monument No. 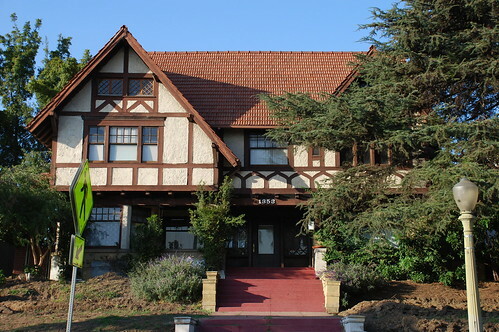 87 is a Tudor Revival house built by Sumner P. Hunt and Wesley Eager around 1902 or 1903. 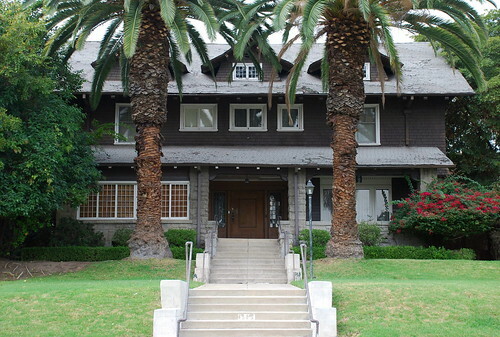 The duo also designed three more HCMs, the Kinney-Everhardy House next door (No. 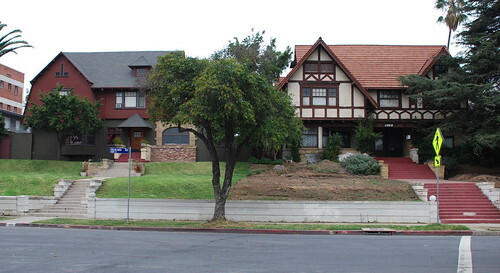 88) as well as homes for Arthur Bent (1904) and Thomas W. Phillips (1905), numbers 482 and 551. 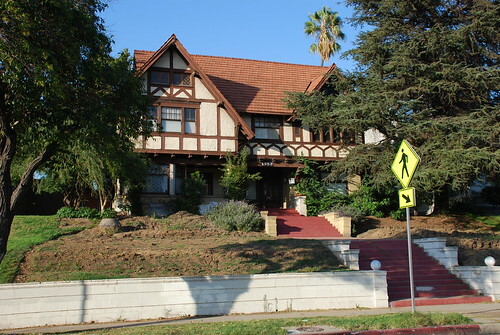 The home was built for Robert H. Raphael, who paid $3,500 for the plot to put up “a home that will cost about $16,000”, according to a Los Angeles Times article from the spring of 1902. Raphael, who made his money in the glass business, requested skillful beveled glasswork be incorporated flanking the main entrance. Of course, I didn't get a good shot of the notable windows. 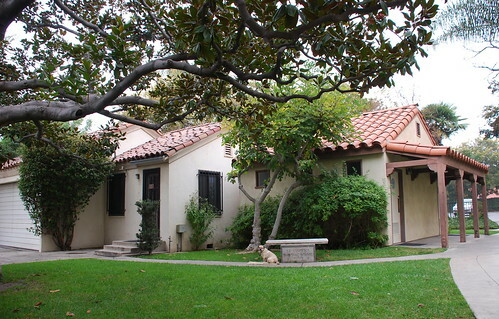 An R.H. Raphael Sr. was living on Rexford Drive in Beverly Hills at the end of 1941. I choose to believe this was the same man who built this house. Further confirmatory research for would be too tedious. 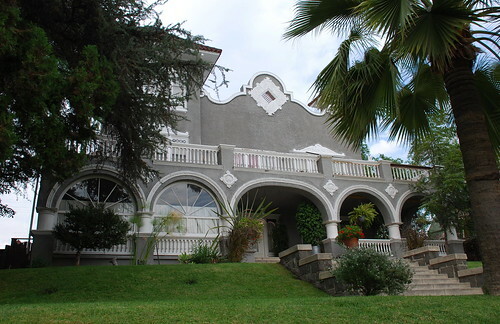 In 1984, the Raphael House was a five-bedroom bed and breakfast known as Terrace Manor. The five bedrooms were “decorated in period prints and colors” and featured “tiger oak and Philippine mahogany paneling”. 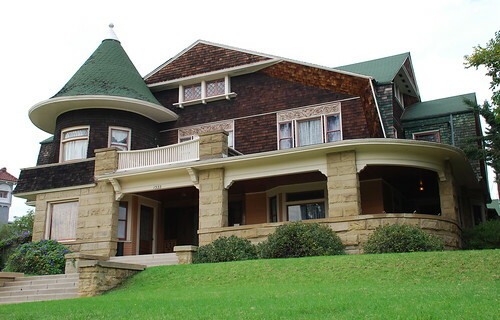 This Mission Revival home was built by and for Pomeroy W. Powers. 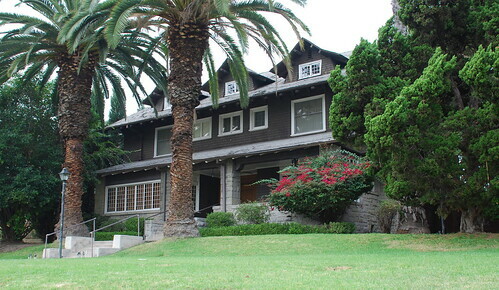 Powers was not only the manager and a principal owner of the original Alvarado Terrace tract, but he was also President of the Los Angeles City Council from 1900 to 1904. 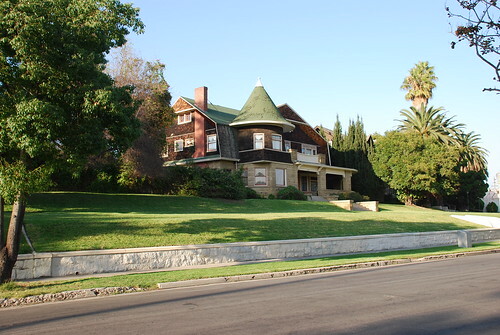 Powers took one and a half lots of the tract for $3,550 in 1902 and also played a big part in developing the small park across the street from his home (originally called Summerland Park, now Terrace Park, it’s L.A. Historic-Cultural Monument No. 210). 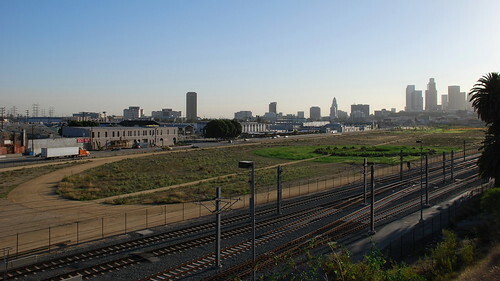 Powers, at the same time as overseeing the Alvarado Terrace development, was also making an unsuccessful run for L.A. mayor. In a statement published in the Los Angeles Times around this time of year in 1902, P.W.P. took the stance of favoring all legitimate commercial enterprises, the eight-hour day, and all needed improvements to streets, public buildings, parks and boulevards, while believing in full protection for all property interests and the continuance of the city’s prosperity. With a platform like that, how could he not be elected? One more thing about the Powers House. 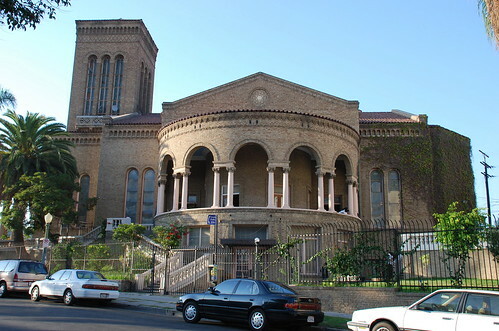 After using the house to minister to the homeless since just after the 1992 riots, the Catholic Missionaries of Charity Brothers were forced out a few years ago after neighbors’ complaints drove the city to enforce the property’s zoning which barred it for use as a church and philanthropic institution. The shelter fought the ruling regarding what they had named Nuestro Hogar (“Our Home”), even taking the city to court, but eventually moved around the corner on Westlake. 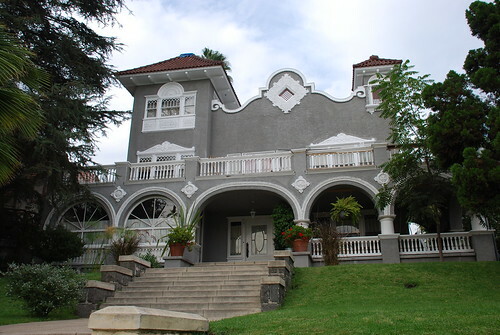 This Queen Anne-ish Alvarado Terrace home was built for William F. Gilbert, about whom I know nothing other than he appears to have built a home on Alvarado Terrace around 1903. 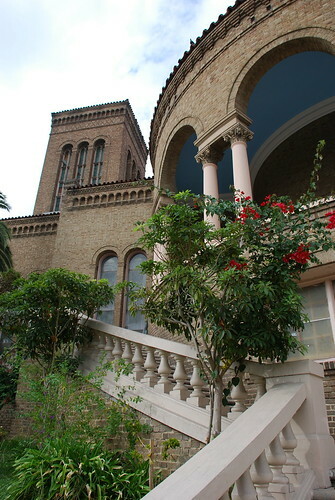 Gebhard and Winter, in Los Angeles: An Architectural Guide, say the lower portion of the house is covered in Santa Barbara sandstone. I love how, in these pictures, except for the paved street, there’s no sign of anything that could pinpoint an era past the building’s original construction – no cars, no 7-11s, no satellite dishes, no Charles Bronson movies, no microwaves, no – well, you get the idea. Not that I've been looking real hard, but I can't recall seeing green shingles like on the right-hand side below. While I’m all for trees, shrubbery, and such, it’s nice to get a really good look at this building without all sorts of foliage blocking the view. This last picture is sort of like the first picture at the top, just from farther away. 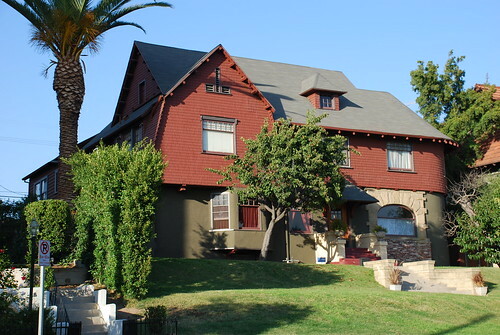 Built for clothier Morris R. Cohn, this is the second of the six Alvarado Terrace homes designated city landmarks on July 7, 1971. After arriving in Los Angeles, Cohn started Morris Cohn & Co., manufacturing overalls, in 1889. 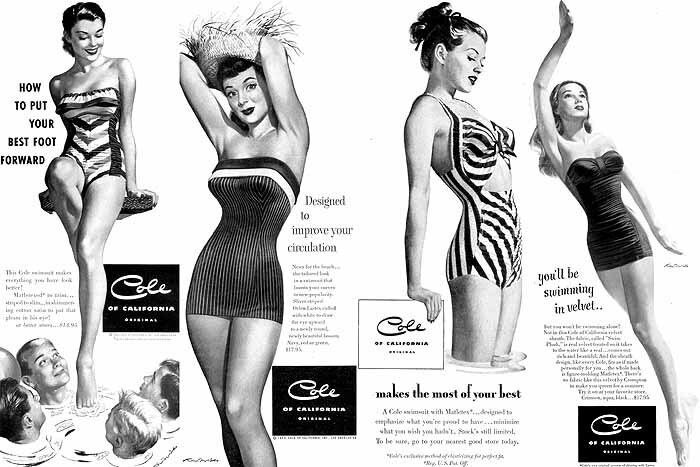 He was the first clothier to bring a power sewing machine to the west coast. 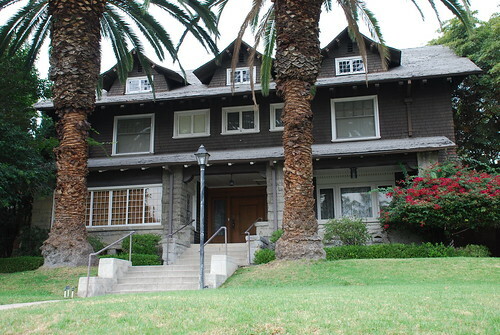 He died in his Pasadena home in 1941. 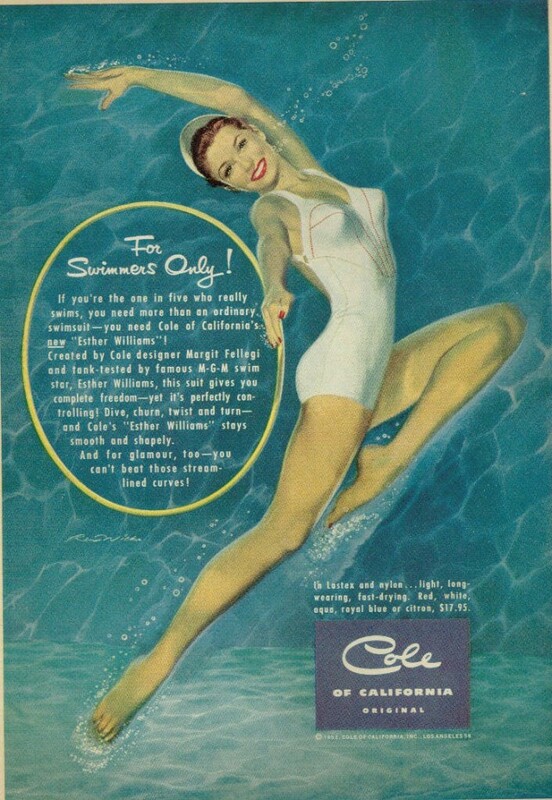 His son, Fred Cole, founded the swimwear company Cole of California in 1923. Cohn gets two Historic-Cultural Monuments named after him. The Cohn-Goldwater Building, HCM No. 119, his former factory on East 12th Street, also carries his name (along with Lemuel Goldwater's). This house – like all the others on Alvarado Terrace – also stands as part of Los Angeles’s Community Redevelopment Agency’s (CRA/LA) Pico Union 2 Redevelopment Project, a thirty-one-year-old plan that “sets forth a variety of goals ranging from neighborhood revitalization, historic preservation, public improvements, commercial development and construction of affordable new housing.” The Project Advisory Committee meets the second Tuesday of every month. 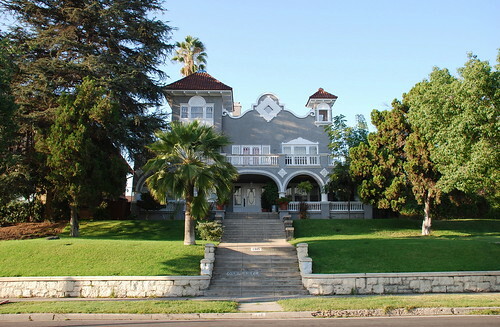 One of six Alvarado Terrace residences along with a neighborhood church declared city monuments on the same day in 1971. The collective designation plaque says the group of buildings was honored for “reflecting Victorian architecture on a grand scale prevalent at the turn of the century.” As both of my faithful readers are too aware, I don’t know very much about arkitekchur, but these homes don’t strike me all that Victorian. Feel free to comment why they are (or aren’t) in this or subsequent posts. 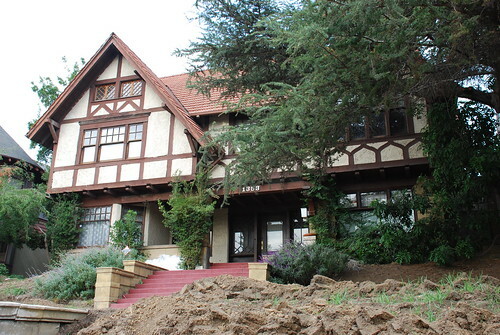 This house (which looks, to me, more Tudor Revival in style) was built for the president of the Los Angeles Transfer Co., Edmund H. Barmore, just more than a century ago. You really can’t see much of the home today, as it’s pretty much covered by trees, shrubs, and such. 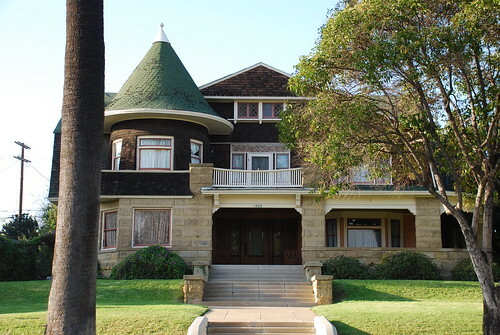 The Boyle-Barmore House is included in the Pico-Union Historic Preservation Overlay Zone (HPOZ) and is listed in the National Register of Historic Places as part of the Alvarado Terrace Historic District. Here’s a final, over-the-fence shot of the building from the back. 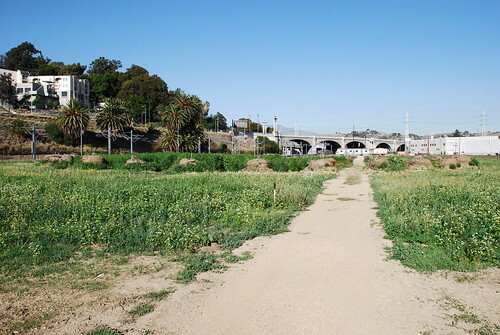 Tongva village, site of the Zanja Madre, Southern Pacific railyard, brownfield, art installation, state park – this 32-acre plot of land has seen more than a few incarnations in its history, with at least one more in store. In Los Angeles’s pre-Spanish days, this and the surrounding area was crawling with Tongva Indians, who had one of their larger villages, Yang-na, in or around here. 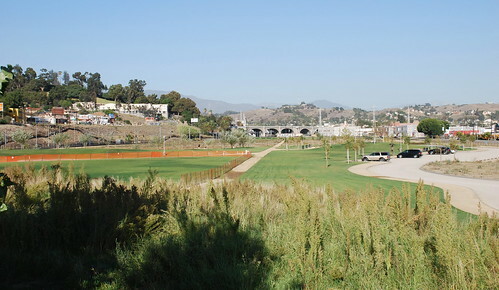 The Tongva (later renamed the Gabrieleño) remained in the area even up to the 1830s, about fifty years after the Spanish founding of the city. 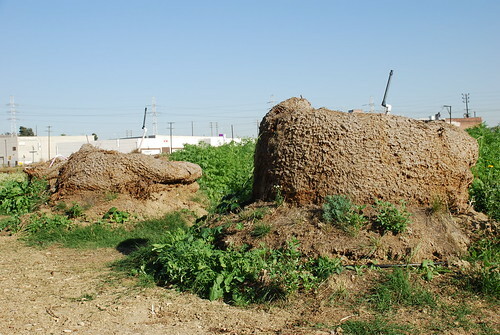 The Spaniards, within weeks of establishing the settlement, began using the new pueblo’s primary irrigation system, the Zanja Madre (“mother ditch”). Two channels of the zanja ultimately flowed through the Cornfield. (The zanja system was the city’s primary source of domestic and irrigation water until 1904). 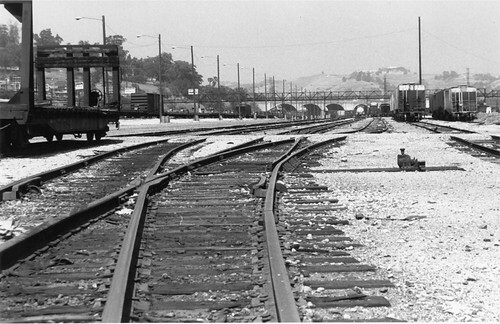 By the time 1873 rolled around and the Southern Pacific Railroad got the rights for a freight house and depot on the land, the site marked the western end of L.A.’s Chinatown. The River Station was the city’s first transcontinental railroad depot and freight yard. 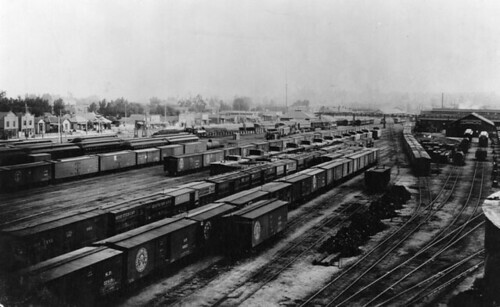 After 1876, the Southern Pacific spread out to the northern part of the Cornfield, building a new passenger depot along with the Pacific Hotel. Trains continued to stop at River Station until 1915. It was for the railroading stage in the land’s history that it was designated Historic-Cultural Landmark No. 82 in 1971. At that time, there were still, of course, many remnants of the 19th-century railyard – “freight yards, warehouses, tracks, switch houses, docks and cobblestone pavement.” Now, that’s all gone – except this old building at the southern end of the site (below), near the Capitol Milling Company. I would imagine this was some sort of old freight house, no? 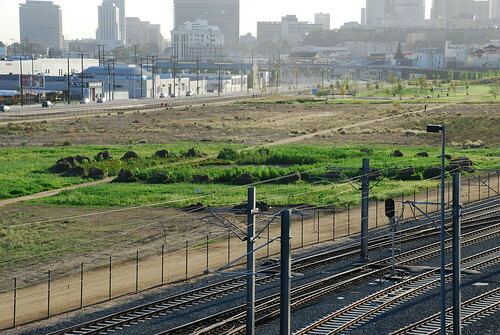 The railyard was sold and abandoned in 1992. 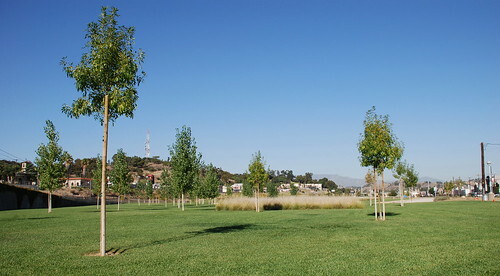 Nearly a decade later, in September 2001, Governor Gray Davis signed a bill authorizing the Department of Parks and Recreation to “acquire, assess, clean up, plan, design, build and maintain the 32-acre parcel.” While the agency appointed a committee to figure out how to accomplish this, artist Lauren Bon created the art project Not a Cornfield, “a living sculpture in the form of a field of corn.” She had 1,500 truckloads of dirt brought in, and then planted a million seeds. (Go to the Not a Cornfield website. You can see tons of photos and videos of not only the art project, but also of the history of the site.) They grew a lot of corn, then harvested it. 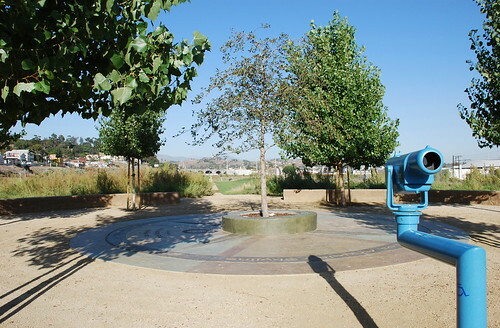 This sneeze-worthy area below (the big circle) is called Cornhenge, another art project by Lauren Bon, launched in November, 2006. An onsite sign reads, “This metabolic sculpture incorporates a variety of native flora commingling with 31 hay bales gathered during the Not A Cornfield harvest.” It’s got marigolds and everything. And here's a Cornhenge close-up. 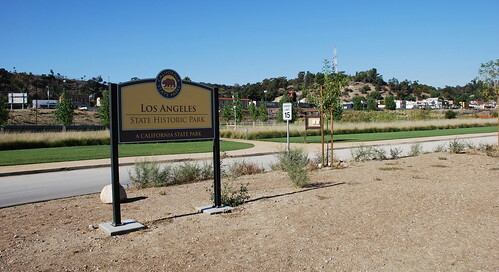 Today the site is the Los Angeles State Historic Park, although its current incarnation is temporary. Some green grass, dirt, a bunch of scrub, and Cornhenge. Here's a shot looking up the path through Cornhenge. 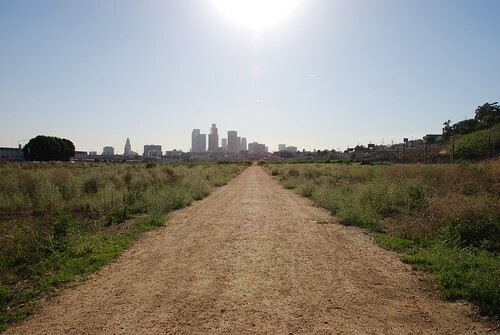 Look at this picture, and then compare/contrast with the shot below it (from L.A.'s Department of City Planing site). June of this year saw the state’s contract being approved to bring on the design team of Hargreaves Associates to begin work on building a new State Historic Park. The firm won a competition last year with a design that “provides a plaza for gatherings and events, gardens and recreational spaces, pedestrian and fauna bridges, wetlands and interpretive centers.” This is set to be realized in 2010. One note: while I know there are lots of folks living in the area, the couple of days I visited here, the (temporary) park was sort of empty with just a handful of people hanging out. That’s fine, but I did notice that it seemed most of the park-goers those days had driven there. My guess is the major obstacle for the city, the state, and Hargreaves is making the park accessible. Maybe the adjacent Gold Line stop will help, but I’m not so sure. The Not a Cornfield site and the Cornfield State Park Advisory Committee’s April 2003 report, "A Unified Vision for Cornfield State Park", were huge helps with this post, and there were some others, but one of the best sources I found on the history of the Cornfield is Michael Dear’s article, “Eye of the Beholder”, on USC’s LA School of Urbanism page. Thanks, Michael.